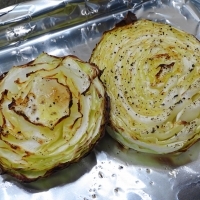 Roasted Cabbage is sweet and delicious, and so easy to make. Peel tough outer leaves off head of cabbage. Cut cabbage in 1" thick slices. Place cabbage slices on foiled lined cookie sheet. Brush cabbage slices with Olive Oil, flip, and brush other side. Roast 30-45 minutes till slices are tender and slightly browned.